Fresh romaine, snow peas, scallions, and mandarin oranges are topped with a savory roast chicken and a toasted sesame oil vinaigrette. Whisk together soy sauce, 1 teaspoon toasted sesame oil, brown sugar, and garlic powder; add the chicken pieces and marinate 15 minutes. Heat 2 tablespoons canola oil in a large skillet over medium-low heat. Add the chicken, raise the heat to medium-high, and cook for several minutes on each side, gently turning the chicken, until the meat is firm and no pink shows in the middle. Let the chicken rest for 5 minutes. Cut into slices. Bring the vinegar just to a boil in a small saucepan. Turn off the heat then stir in the sugar. Let cool. In a medium mixing bowl, combine the cooled vinegar with the remaining salad dressing ingredients except the canola oil. Slowly pour in the oil while whisking. 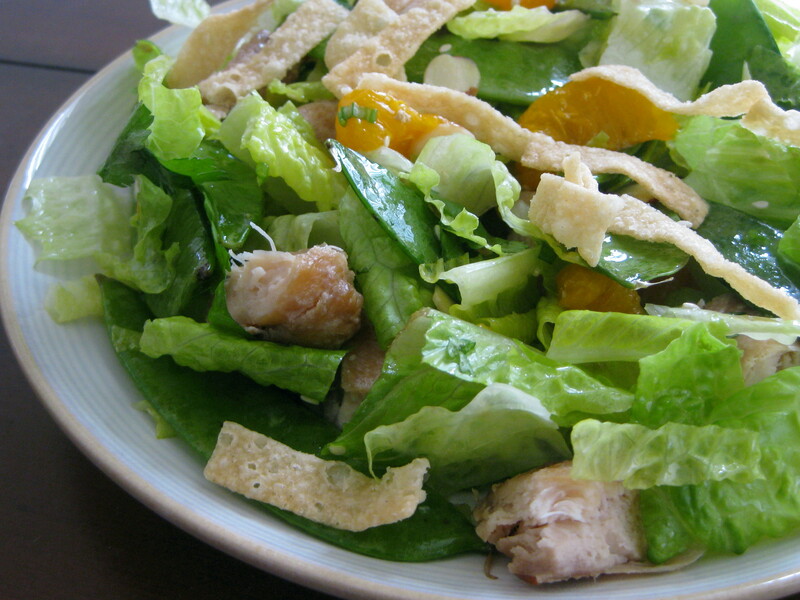 Toss the lettuce with the salad dressing and toasted sesame seeds, and divide between four plates. Top with chicken, cilantro, scallions, orange slices, almonds, and wonton strips.